Home » GOD CALLS » I knew you even before you were conceived. 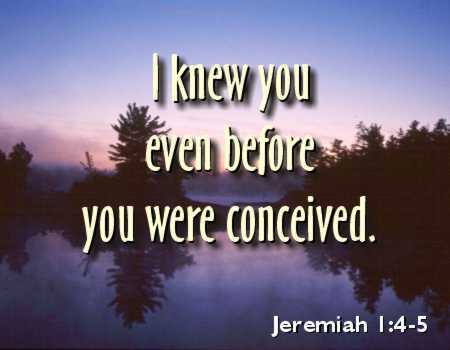 When Jeremiah was called to be a prophet to Israel, God declared that even before he was conceived, he was known by God and set apart for His divine purposes. The road that Jeremiah would walk in his ministry life would not be an easy one, for he suffered much abuse at the hands of his fellow Israelites. I wonder if he ever reflected on these words when he was going through his darkest times? When he was alone in that cold, damp prison cell, did he ever go back to the beginning of his ministry and meditate on God's words to him? I believe the revelation that he was known by God, and set apart for His purposes, gave Jeremiah the strength to continue to walk out his destiny, even in the darkest of times. Knowing that it was God who knew us, and formed us, and called us into life, is the bedrock of our existence. When everything else around us is not making sense, this truth can give us the grounding that we desperately need to go on. We are all looking for a sense of meaning and purpose in our lives. Many people have not received this affirmation from their parents, but it was not their parents who knew them before they were conceived, but God. It was God who formed each one of us in our mother's womb and called us to life. It was God who set us apart for His divine purposes and plans. Before an architect constructs a building, he meticulously puts every detail on paper, every component needed to make his dream into a reality. The idea is first conceived in his mind, then is transferred on paper, and then when everything is just perfect, he starts the process of building his creation. In my own limited understanding of God's creation process, this is how I imagine it to be. He first conceived us in His mind, and with great thoughts of love, He began to chart every detail of our DNA in preparation for the time when he would form us in our mother's womb. What a wonderful thought, to know that the God of the universe knew us intimately and set us apart for His purposes even before we were conceived! Father, Your love for me existed even before you formed me in my mother's womb. You knew me and set me apart for Your special purpose long before I was born. Help me to receive a deeper revelation of this truth, so that I might continue to walk out my destiny in the shadow of Your love. In the name of your beloved Son Jesus, I pray, AMEN.